Taken in September 1996 at Alchemy, Lee Harris’s shop on Portobello Road at the launch an book signing of Mr Nice. 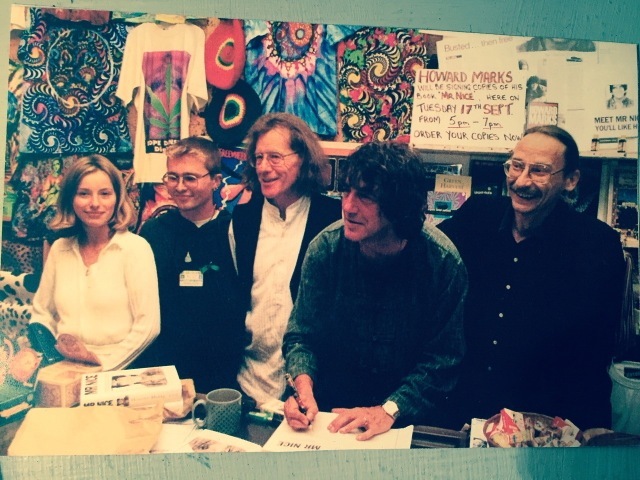 Howard Marks and Hearmt Targowski with members of the public. Howard Marks was a folk hero out of the annals of Discordia, a living legend in his time who will be remembered for his swashbuckling dope –smuggling adventures throughout the world. A dashing, handsome. charming, restless wayfarer and one of the most exquisite rogues of our age. I was privileged to have known him and shared many high times during the twenty years I knew him. I met him at the Groucho Club in 1995 when I was bringing the beat poet Allen Ginsberg to the Megatripolis cave club in the heart of London. He had recently been released from serving ten years of his sentence at Terra Haite Prison for smuggling kilos of cannabis hash in speakers of rock groups. I wanted him to speak at the Megatripolis. It was the first of thousands of performances during the ensuing years. I took him around and introduced him to the hosts of people eager to meet him or share a joint. I met his wife Judy, his children Amber, Francesca and Patrick, and went to Amber’s 21st birthday party. During the coming years we travelled to Spain, Germany and Holland at major cannabis events like the High Times Cup annual event in Amsterdam. At his performance debut at Megatripolis, Howard hit home. He loved the E for Ecstacy generation and they took him to heart. 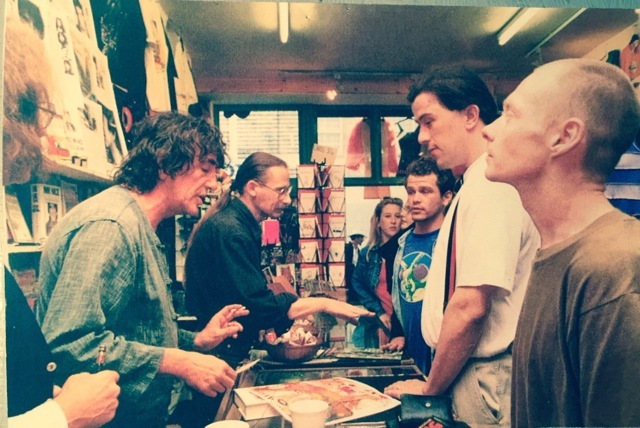 When the hardback edition of Mr Nice came out he did a signing at my Alchemy shop in London’s Portobello Road in September 1996, where over a hundred copies were signed and sold. He treated everyone with warmth and charm and we had a great after-party on All Saints Road till the early hours of the morning. Howard was a party animal who loved to mix his drugs and drink but was never out of order. In 2002 Howard and I went to Sean Williams’ studio in Ladbroke Grove and recorded a track with the Mystery School, a spontaneous rap which he set up, Three Men in a Boat. It is on the album Alchemy – Thirty Years of Counterculture. It was nice verbally fencing with his engaging mind. A re-mix of the track by River Styx AKA Hidan Bardacy appeared on the album Angel-headed Hip-Hop in 2008. During the launch party for the Alchemy album at the Subteranea club under the flyover on the Portobello Road we performed the track in a live jamming session, and Howard said on stage that “Lee is probably one of the people I love most in the world.” Howard was a warm and generous man. Howard was a committed campaigner for the legalization of cannabis, standing as a candidate in by-elections, talking at rallies, and marches and smoke-ins. I was often by his side and shared many platforms with him. I last saw Howard at the Forum in Kentish Town at his farewell concert. There were great entertainers and poets; John Cooper-Clarke, Super Furry Animals, Rhys Ifans and Cerys Mathews to name a few, and a Welsh male choir. Howard’s cancer had kicked in. I managed to see him and give him a kiss and hug. The man was so adored and touched our lives with his love and light. Do not go gently into that good night / Rage, rage against the dying of the light. Blessed be you Howard in life as in death. One love. An early contributor to International Times, Lee Harris generously wrote this piece for us today during his busy schedule of interviews, as he is campaigning in the London Mayor election as candidate for CISTA. International Times will give a platform to his campaign over the next few weeks. This entry was posted on 14 April, 2016 in homepage and tagged alchemy, Alchemy – Thirty Years of Counterculture, Allen Ginsberg, Angel-headed Hip-Hop, Cannabis, Cerys Mathews, Discordia, Drug Smuggler, E for Ecstacy, Groucho Club, High Times, Howard Marks, international times, John Cooper Clarke, Julie Goldsmith, Lee Harris, legalization of cannabis, Megatripolis, Mr Nice, Portobello Road, Rhys Ifans, River Styx AKA Hidan Bardacy, Subteranea Club, Super Furry Animals, Terra Haite Prison, the Mystery School, Three Men in a Boat. Bookmark the permalink.